Los Angeles County Sheriff’s Department Missing Persons Unit detectives are seeking the public’s assistance in locating Jeremy Cole Hawkins, a Covina resident. He was last heard from on Saturday, June 23, 2018, at 11:30 p.m., from the Perris, California Area. 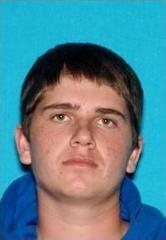 Mr. Hawkins is described as a 20 year-old White male, 5’10”tall, 200lbs, with short brown hair, and hazel eyes. He’s unshaven and has a tattoo of a mermaid on his right arm. 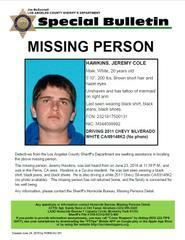 He was last seen wearing a black shirt, black jeans, and black shoes. The vehicle he is driving is a white 2011 Chevy Silverado CA/69148k2 (no photo available). Mr. Hawkins has not returned home and his family is very concerned for his wellbeing.